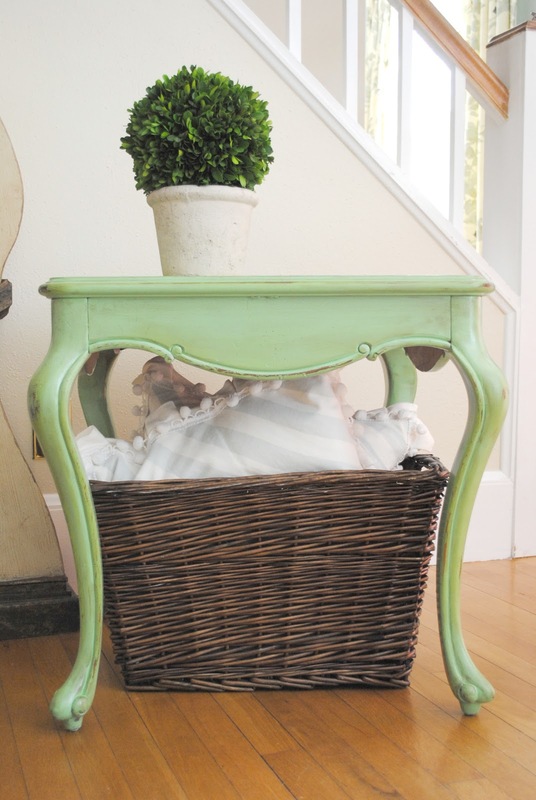 Well, let me just start off by apologizing for not taking a before pic of this adorable little green side table...BUT, let me reassure you...it wasn't that great. It was a $4 thrift store find that needed some serious TLC. The reason I bought it (other than those GREAT legs) was to practice using a stain. 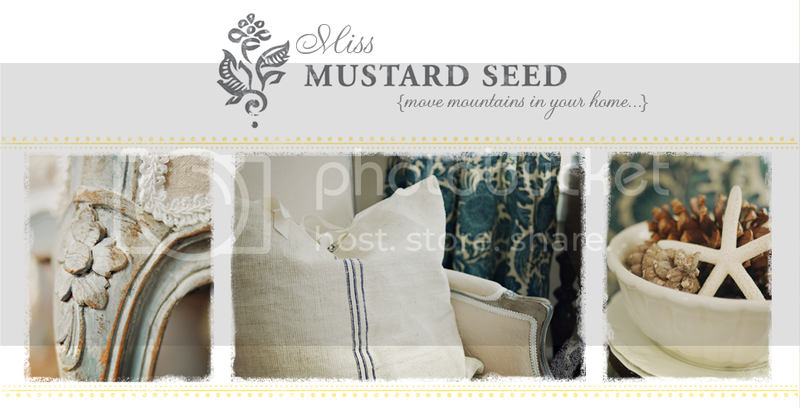 I am totally inspired by a woman named Marian, aka Miss Mustard Seed. Check out her blog if you have an afternoon to kill. LOL! Seriously, you will get so wrapped up in her posts, you will lose hours. Anyway, in her tutorial about staining and glazing furniture, she suggested using Minwax's Dark Walnut stain to "antique" furniture. The stain looked really dark and scary to use, so I bought a little tester jar and a cheap piece of furniture to practice on....and holy smokes...let me just say, this stain is liquid gold as far as I'm concerned! It gave this little castaway a whole new lot in life! The process is so simple. 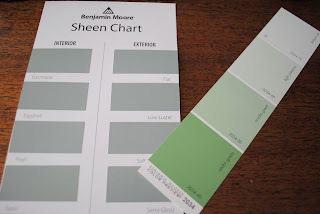 All you have to do is paint a piece of furniture. 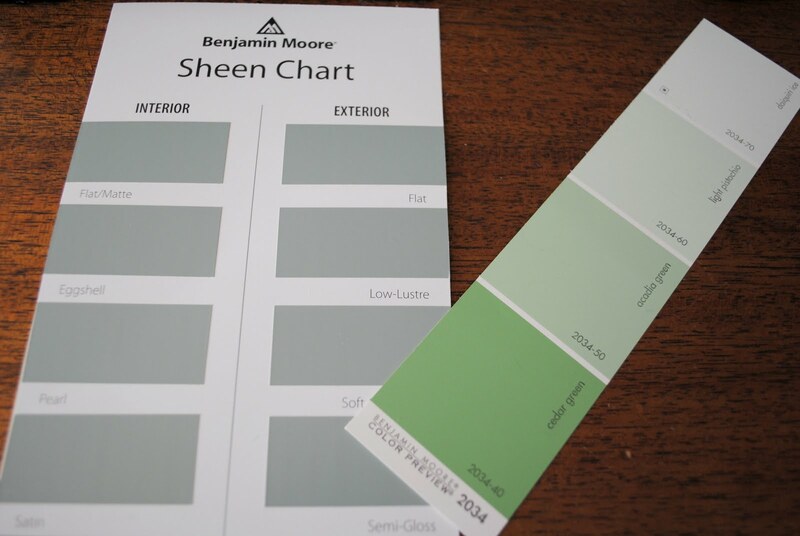 I chose a really bright color - Cedar Green, with a low luster finish, by Sherwin Williams (which btw, is AWESOME for painting furniture), so that the stain would purposefully tone down the color and show off the carved detailing on the side panels. I painted the table two coats, letting them dry between layers, then sanded the edges and "high points" using a fine grit sand block. I then took the Minwax stain and using a clean cloth, rubbed it on in sections, wiping off the excess as I went along. This is the same process I used with the glaze on the vanity makeover. 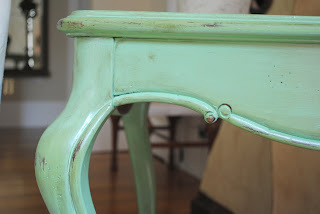 Immediately, I notice how it was softening the bright green color and encouraging the details and distressing. I love it! After the stain dried (24 hours), I applied Minwax's Finishing Wax and buffed to a dull luster. Beautiful! I am adding this piece to the Couture Collection. Remember last week how I said to try to add an unexpected POP of color in your home....hmmm, this little side table would certainly do the trick! Love this table, and love the green! 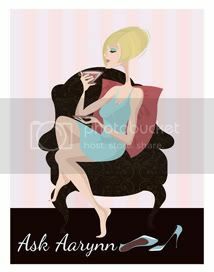 I, too, have spent LOTS of hours reading Miss Mustard Seed--you really do need all day! This table is really adorable. Reading your blog makes me want to thrift store shopping! 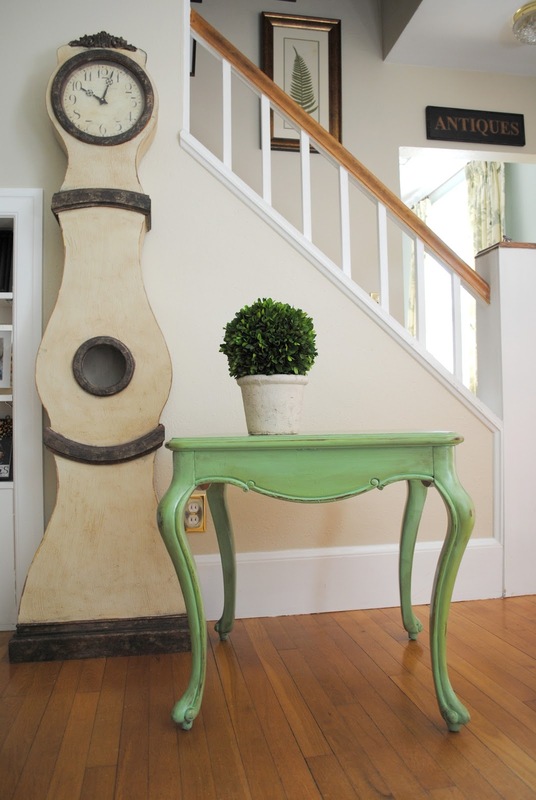 I'm so inspired by all of your re-purposed furniture! I'm a college student with champagne taste on a beer budget and I'm looking forward to using your tips for my apartment furniture! Keep up the great work!